Hi Everyone!!! 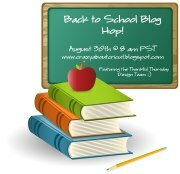 Welcome to the Back to School Hop with the Thankful Thursday Design Team. I hope everyone has enjoyed their summers. Now it is the time for our children to head back to school, hit the books and make us proud. Hey, I can boast; hehe I love it when our son brings me artwork he's done that he's very proud of - spelling tests he's done well on. On occasion he will bring a note in his notebook from the teacher. Oh, don't jump to conclusions just yet. He usually follows that up with they'd like you to make something Mama; they want to ask you something. I love that he's not worried about what they may have written in the notebook. He does come to me if he's done wrong and we talk. Now on to the formalities. Sorry that I went on there, but this is a great time for me. I will miss our son while he's in school, but I look forward to the news he has each day when he arrives home. If you stopped by to see what I have been up to thank you for stopping!! I'd love for you to stay, but I don't want you to miss out on our hop as well. I'd love for you to see all that we ladies have created for you. I'd like you to start with our lovely Hostess, Jenny at Crazy About Cricut; then come back here of course after you've hopped through the other ladies wonderful sites. I will have some other things that I'll be sharing with you. I have some things that I'm trying to put together for some of the special people at our school. If you have come from Heather at Paper Junkie; then you are in the right place. I hope you have enjoyed what you've seen so far. Here is something that I put together for a few people at school. I wanted to wish them a great school year! I am very appreciative of what our teachers and therapists and other people that are involved with our son's school life. I pray for them each day. Cut paper 4 1/2" x 4" enough to cover the rolo candy. You may use pinking shears to trim the one edge of the paper to indicate a sharpened pencil. Use the pink cardstock cut at 1/2" to roll around the top part of the rolo candy to make the eraser. The foil is then wrapped to separate the yellow from the pink, but to create the basket that the eraser sits in. You can then add the Hershey Kiss to the end to make the point of the pencil. Using a glue dot or double sided tape to adhere. If using double sided you may want to use a clear tape around the bottom of the yellow and have it catch just the edge of the kiss to make sure it stays in place. You may add a tag for the sentiment or you can create a label. We decided to create a label. I will now send you on to our next designer; Sharon at Simply Sweet By Sharon. I want to thank Jaded Blossom for being our sponsor for this hop. Thank you!! I just love that we have such similar projects... great minds think alike, huh?!? What a great project. Love it for cute gifts. Leah~ I love your "pencils" LOL. I really wanted to make some for my girls to take to school but, I was told "Mom we are getting to old to take treats to school" I guess thats what happens when your children get to be in 7th and 9th grade. Oh how I wish they were younger.